Use dynamic Google Cloud Translation services. Cloud Translation by Google provides fast translation from the source language to more than 100 languages. 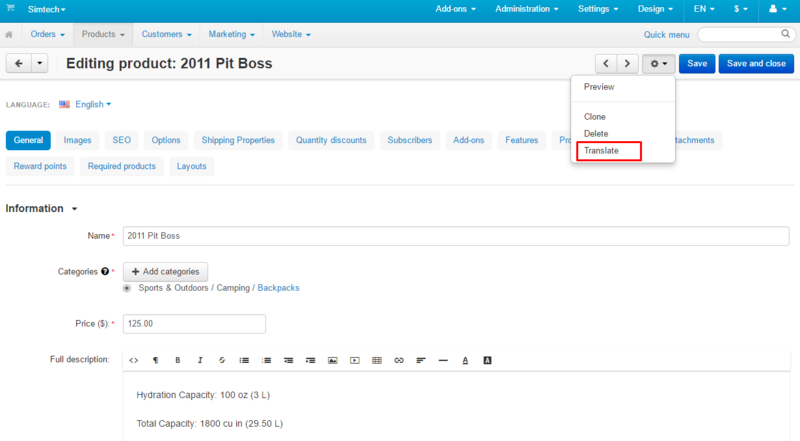 The add-on is especially useful for those who provide the store content in several languages. As it maximally reduces the time expenditures. It is an easy way to get a translation literally in one click. You just add a new product and the translation to the target language or languages is created automatically. Unlike online translators, Cloud Translation by Google saves the obtained data to the store database. So the results can be used in search queries. Please note that Google Cloud Translation services are fee-based. Refer to their site to learn what the price is. Translation of products, categories, blog, pages, newsletters, order statuses, payment methods, shipping methods, user groups, currencies, features, options, blocks. Unlimited number of targeted languages. Ability to select events that activate Google translation (such as the creation or update of a product via website). Ability to select fields to translate. Ability to specify the source language and the target language(s). Ability to translate the already translated entities. The entire site translation in one click. [!] The products were not translated when opening the product by selecting a store in the admin panel or on the actual store. Fixed. [~] The code has been improved. [!] A typo in the "Cron" word. Fixed. [!] Features were not translated. Fixed. [!] A new product wasn't created with CSV import. Fixed.